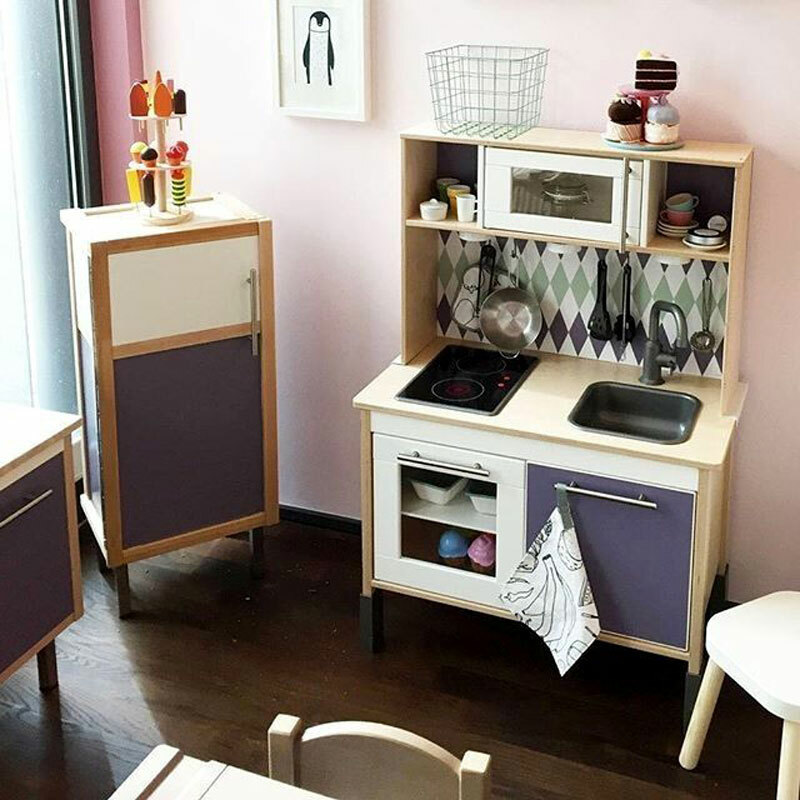 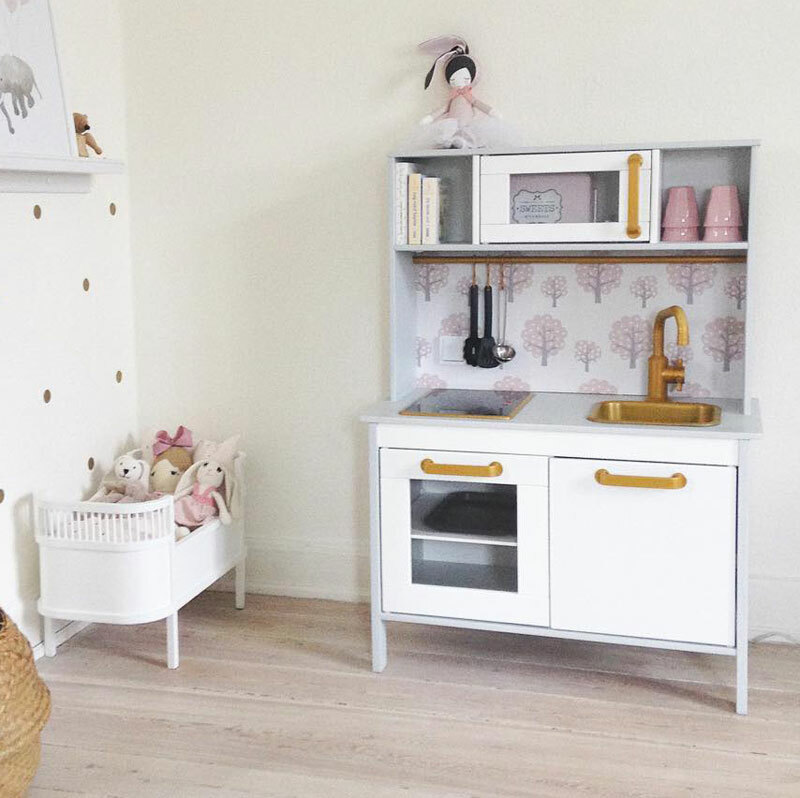 For a while now, the Duktig play kitchen by IKEA has been popping up all across the web and has become a popular toy among young children who like to copy their parents by pretending to cook their own food. 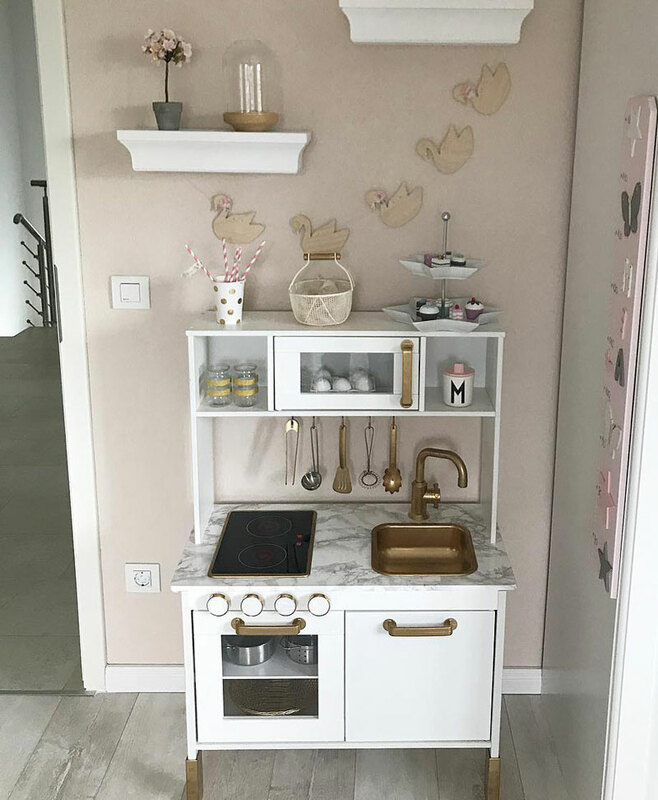 This can obviously be attributed to the kitchen’s gorgeous design and fairly affordable price. 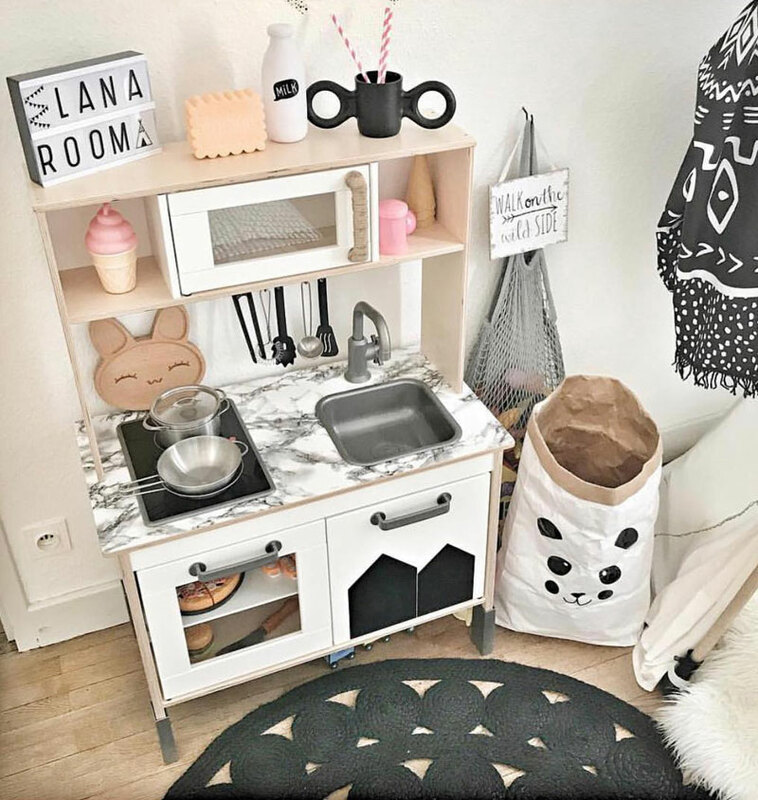 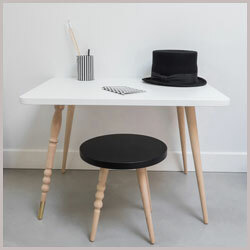 But, IKEA owes its product’s reputation considerably to the creative parents and designers who recognised the potential for some genius ways to make it more fabulous. 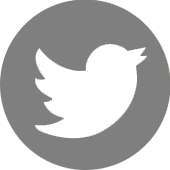 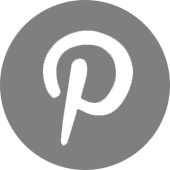 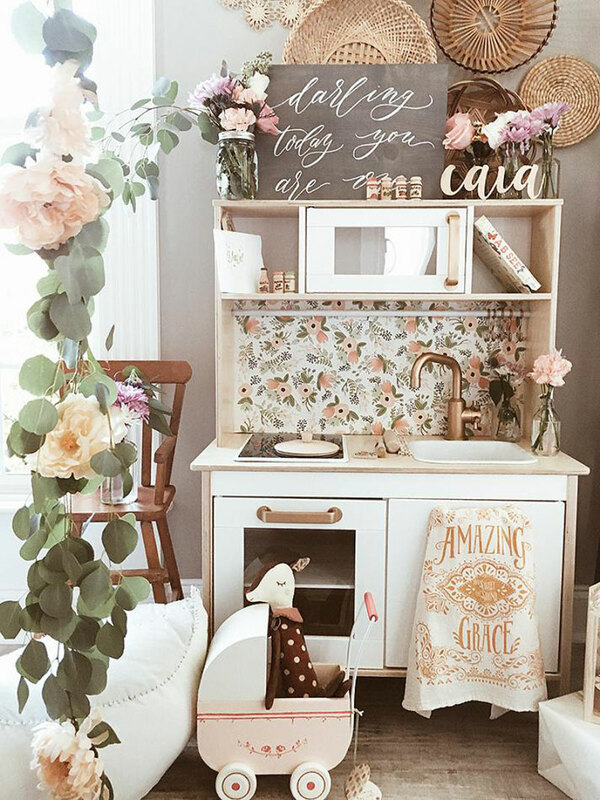 Instagram and Pinterest are overcrowded with beautiful and innovative hacks that will leave you asking; WOW is this the same kitchen? 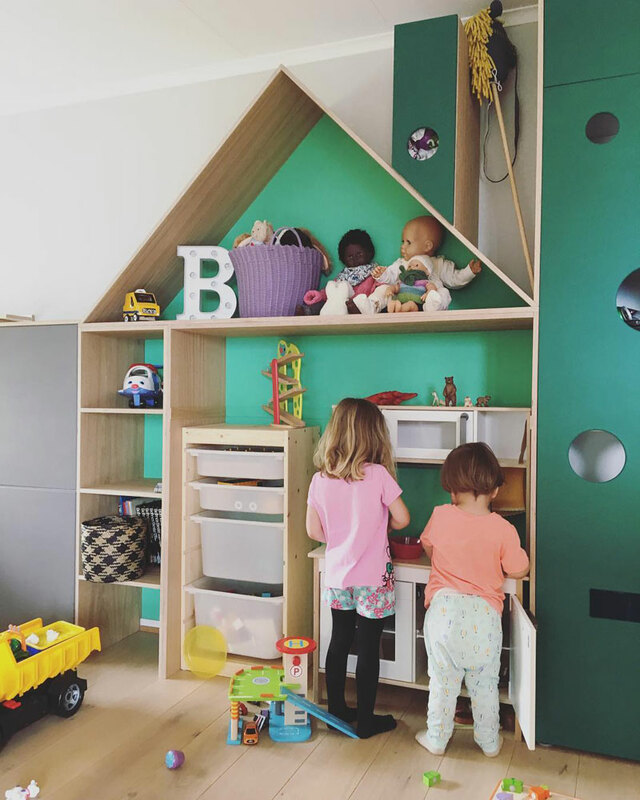 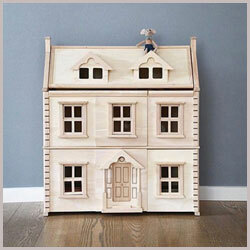 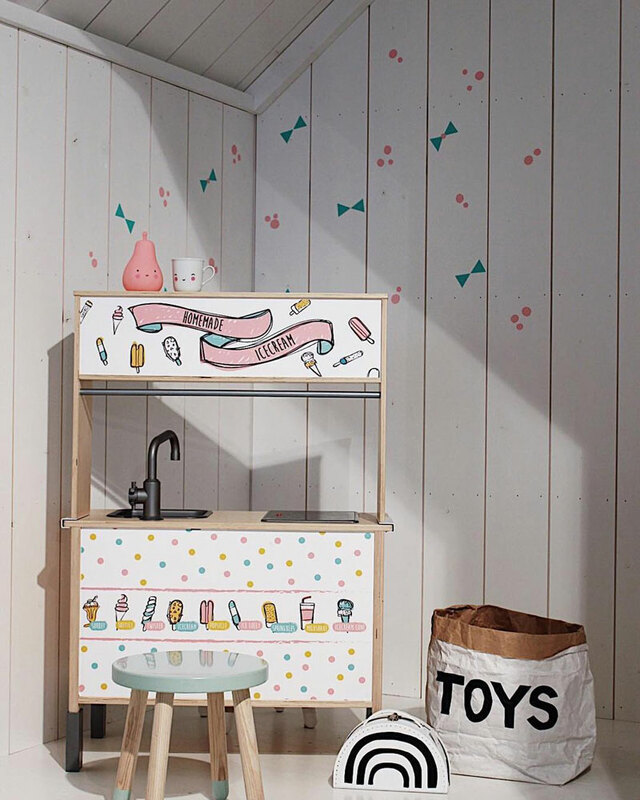 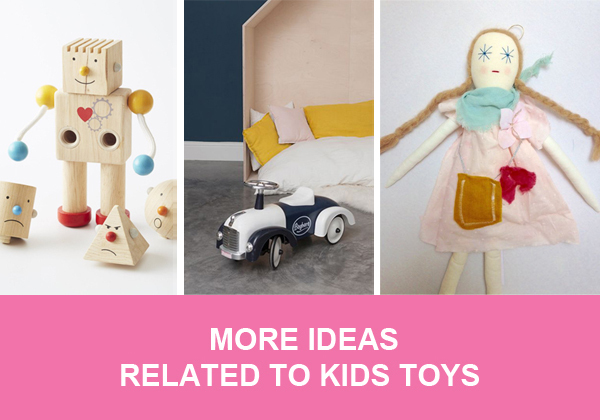 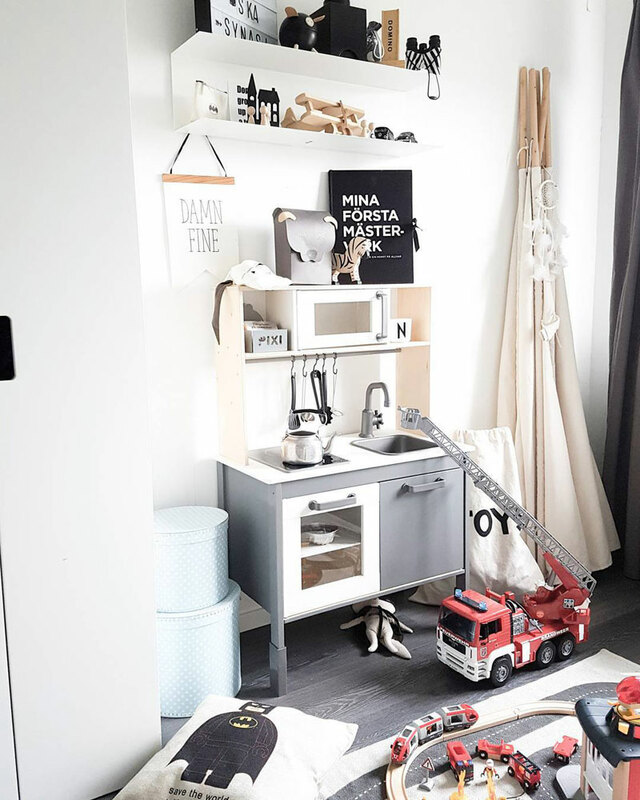 Like many other IKEA products, the toy’s simple design – plain wood and white, make a perfect basis for modifications such as different colours, fun handles, lights, various add-ons, repurposing and many others that you are going to witness in a moment! 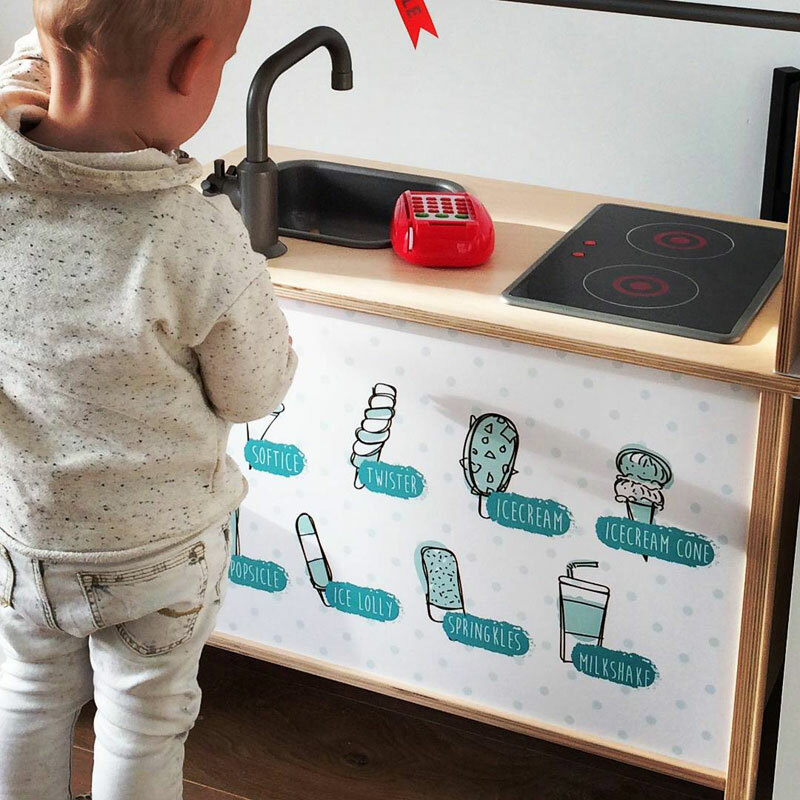 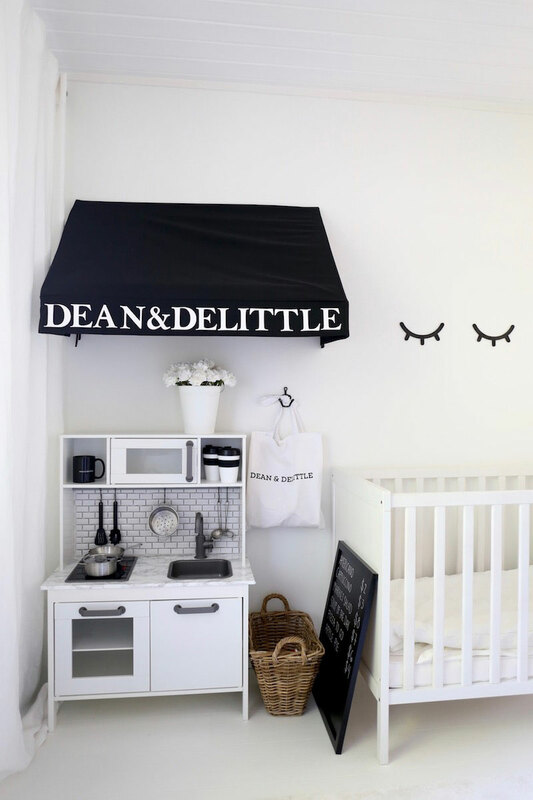 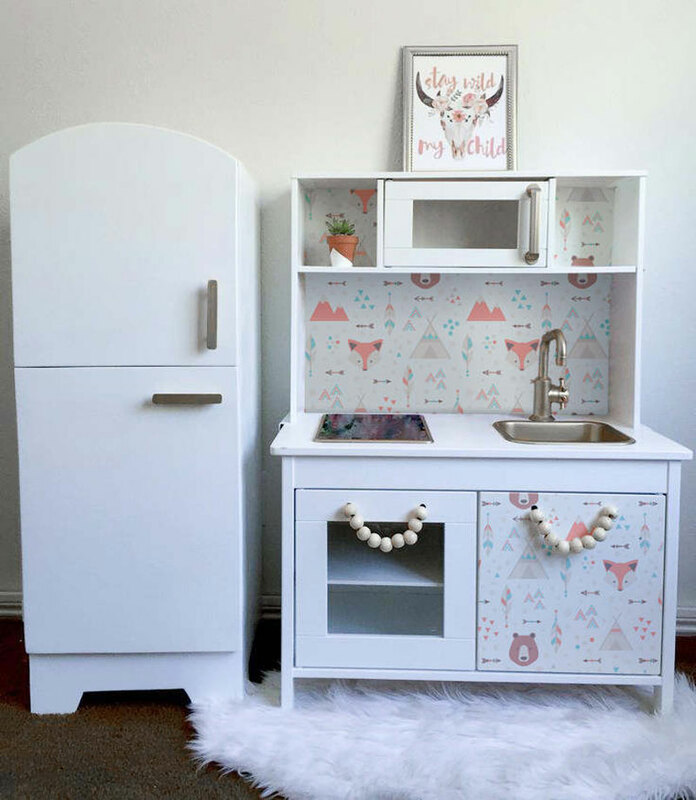 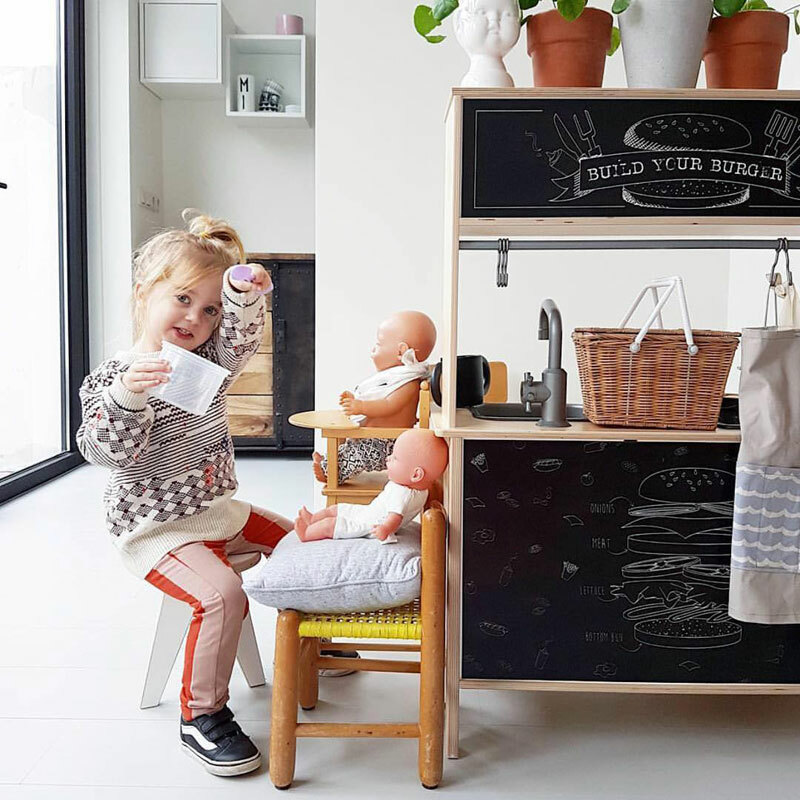 So, why don’t we take a look at how YOU can modify the Duktig play kitchen to make it more appealing to your little chefs. 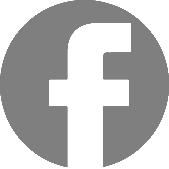 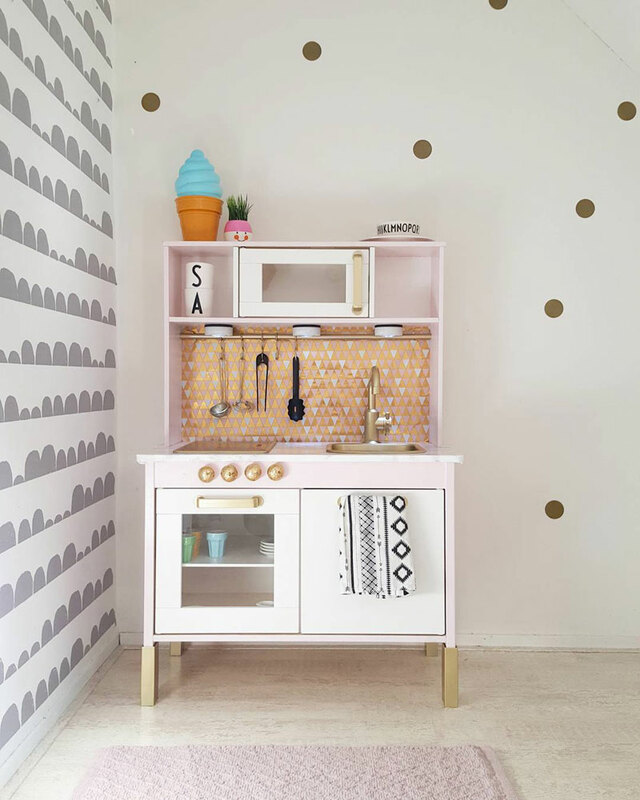 The first thing you should consider is giving the kitchen a fresh and unique coat of paint. 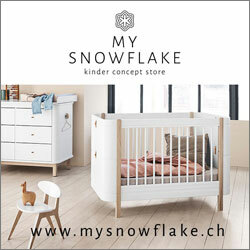 Any colour goes! 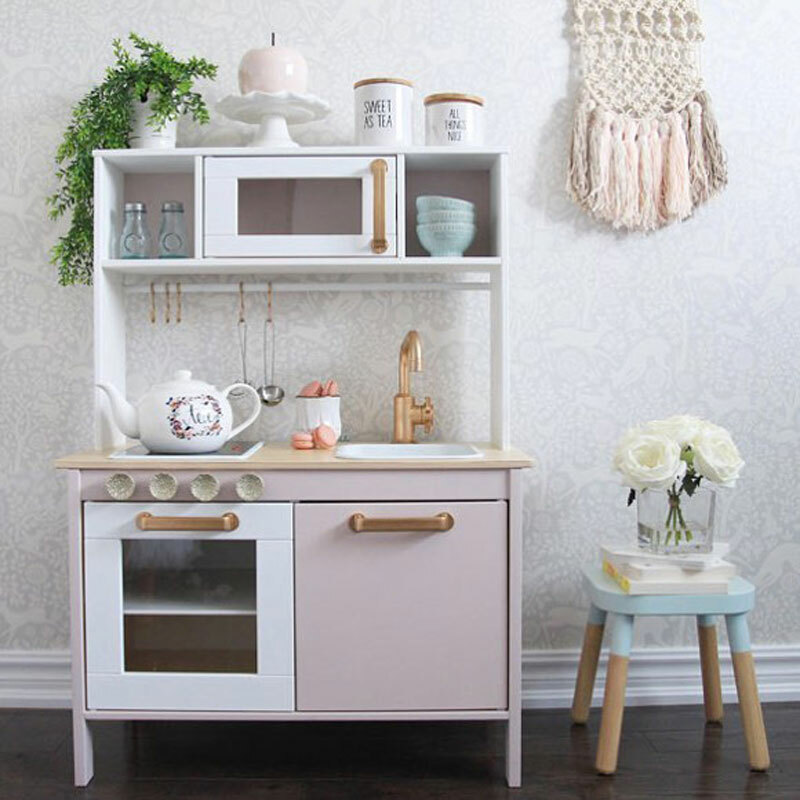 By playing with different hues, you can easily give it a modern, grownup makeover or more cheerful and fun look with the introduction of gentle pastels. 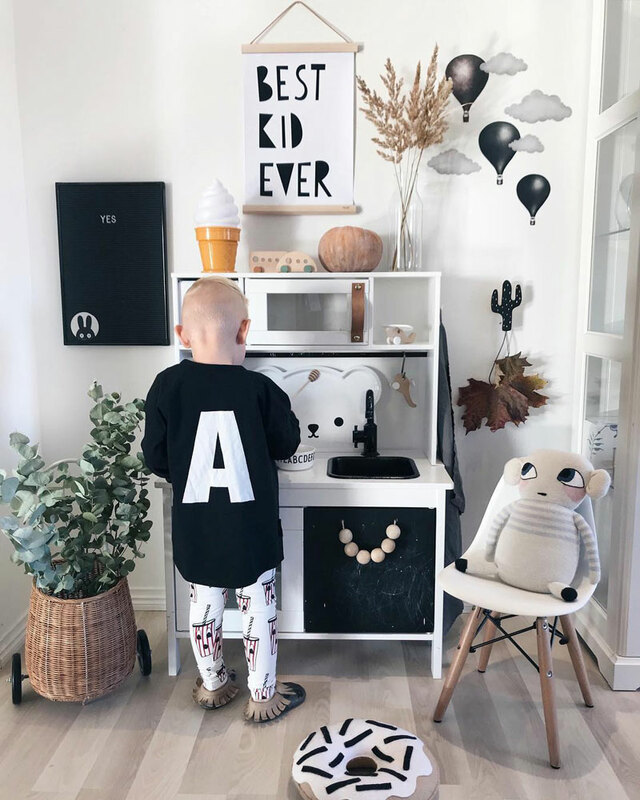 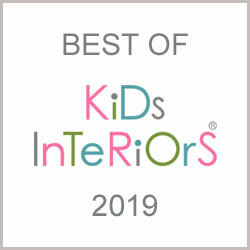 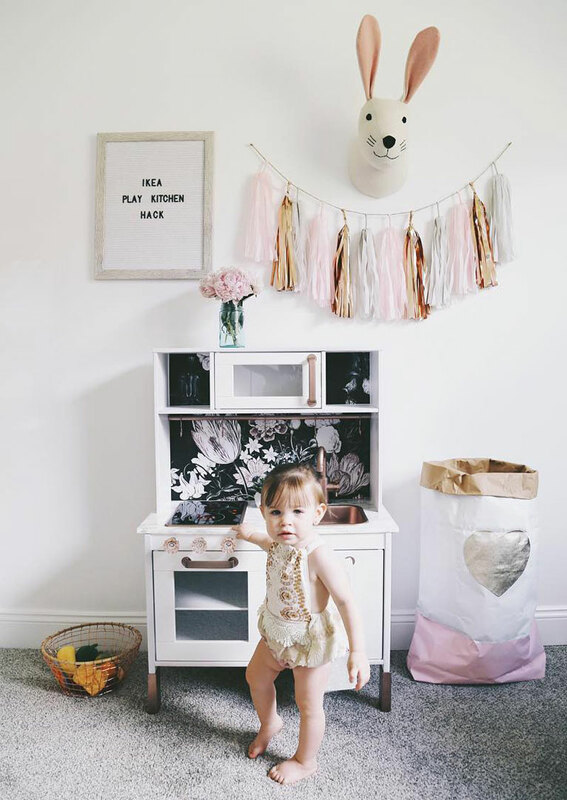 However, if you’re a design freak trying to keep everything in your kid’s room match perfectly without any exception then you know what to do! 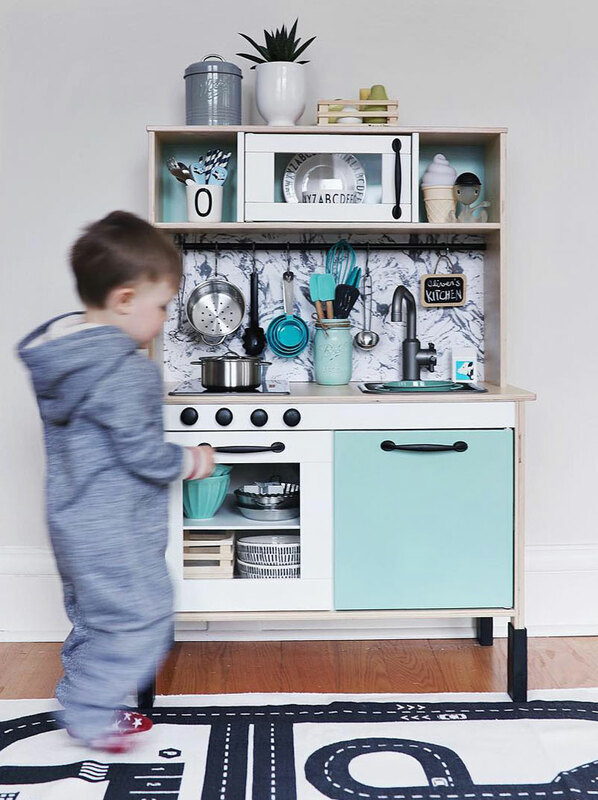 You can also put custom handles and change the colour of the sink matching the new look and, to make it look more realistic, knobs could be added above the oven together with LED lights in the microwave. 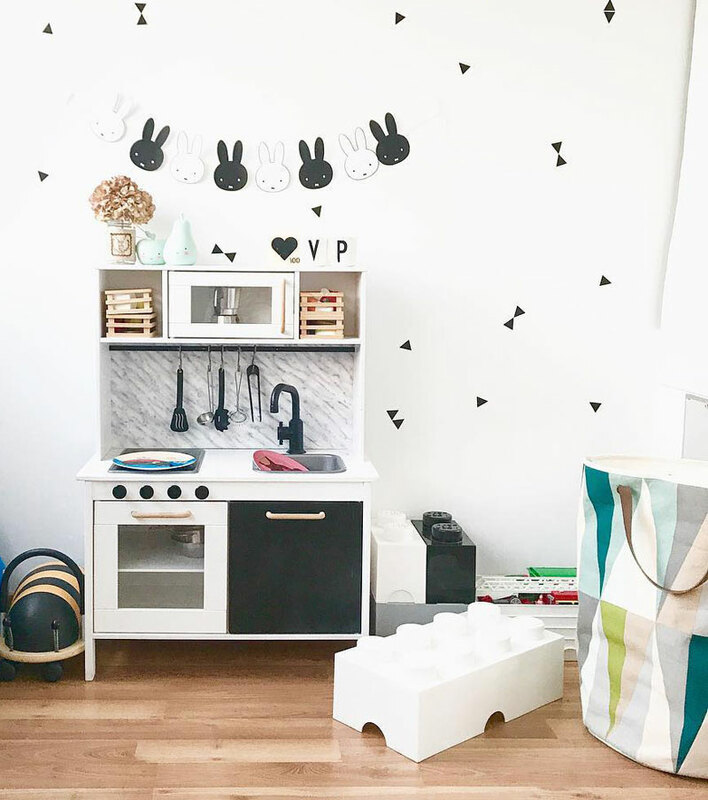 The backsplash made of wallpaper should be the central element which is going to define the play kitchen’s new appearance. 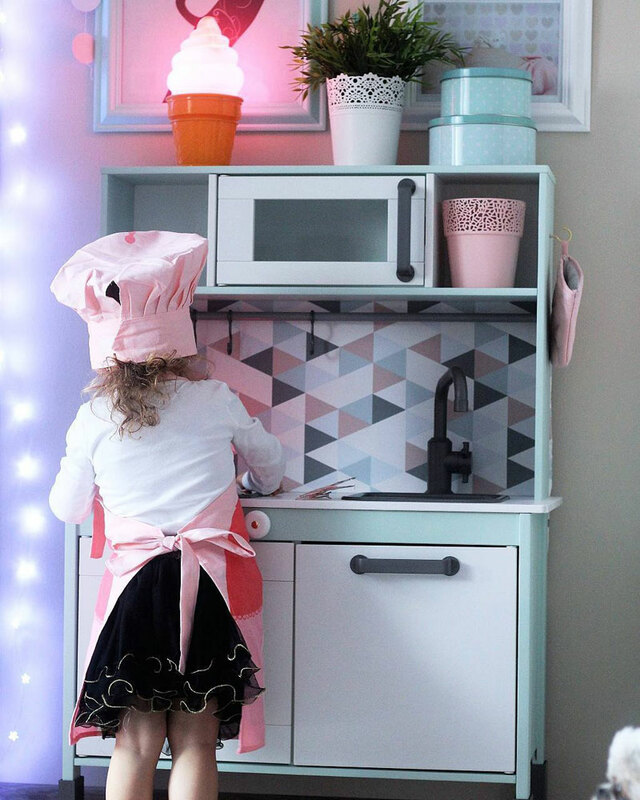 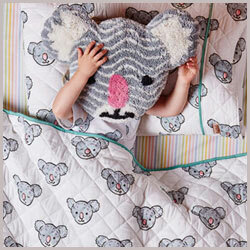 You can go from tiles to flower motifs and whimsical patterns – whatever matches the base colour that you selected. 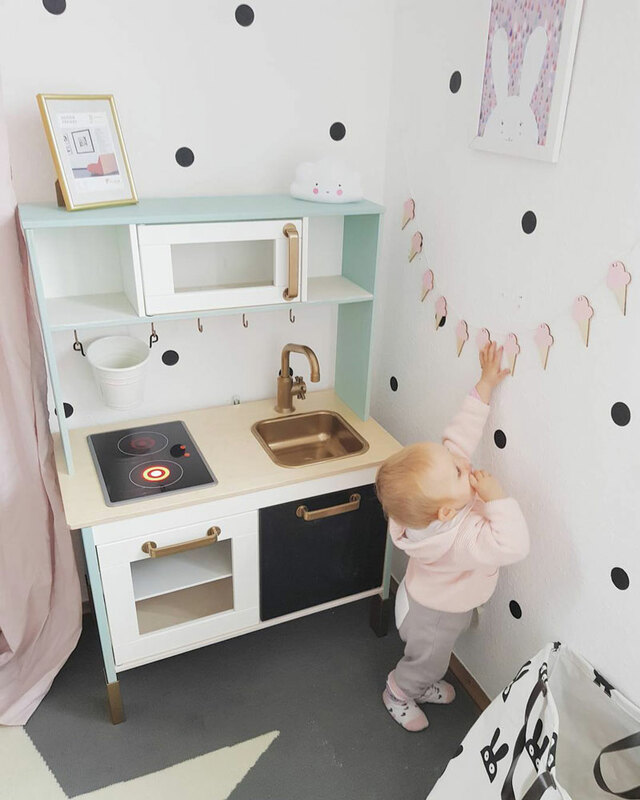 Another option would be to drag a pattern that’s showing up around your kid’s room and place it on the backsplash allowing the play kitchen to fit in like a puzzle. 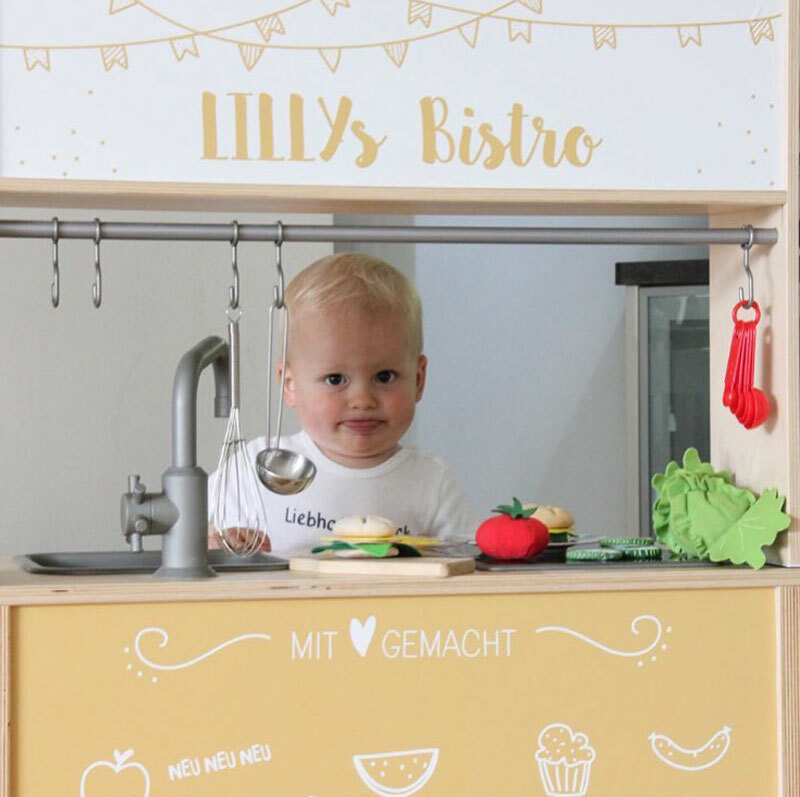 The brilliant Duktig play kitchen could be repurposed to serve as more than just a place for cooking and washing dishes. 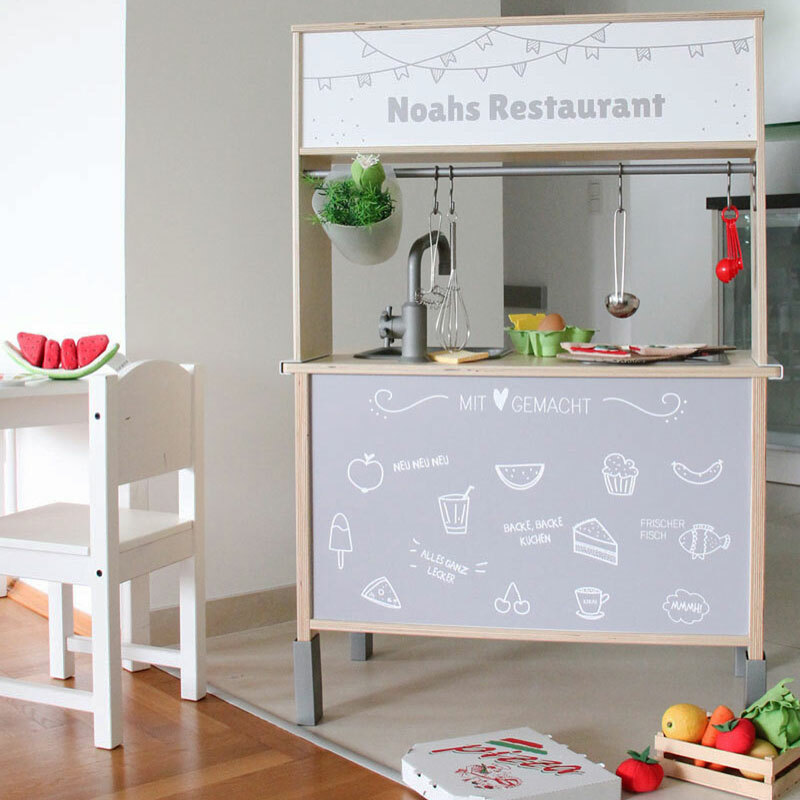 For even more fun, turn the kitchen around without facing the wall, and you get a small food and drink stand. 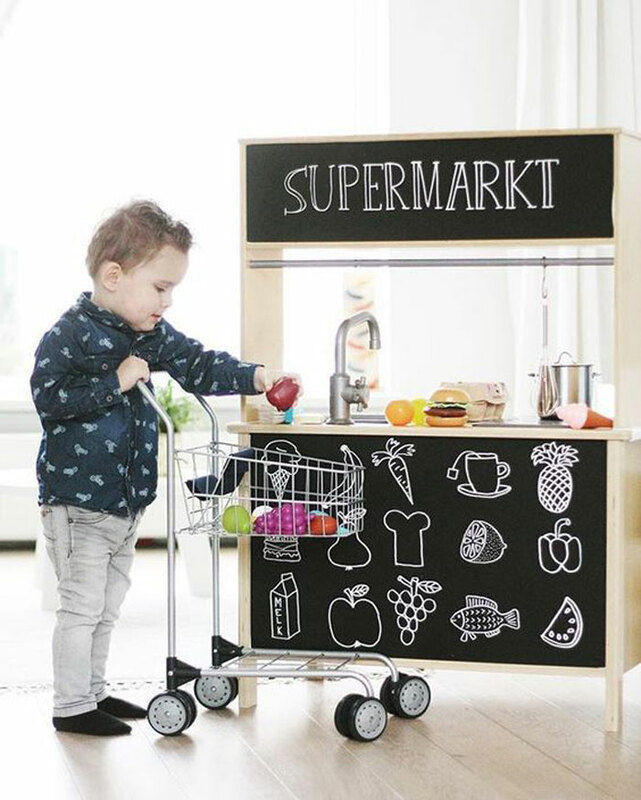 Let your kids choose a name for their restaurant and then put a sign on top or better yet use chalkboard paint so they can decorate and scribble themselves. 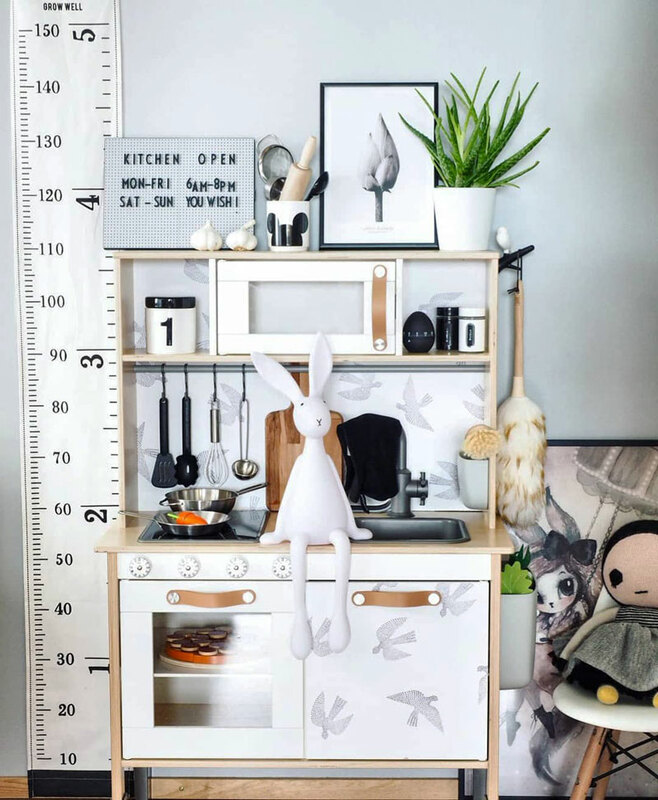 Consider expanding the kitchen experience with toy pots and pans, utensils, appliances and food along with extra storage, shelves, wall hangers and anything else that is going to spice up the place. 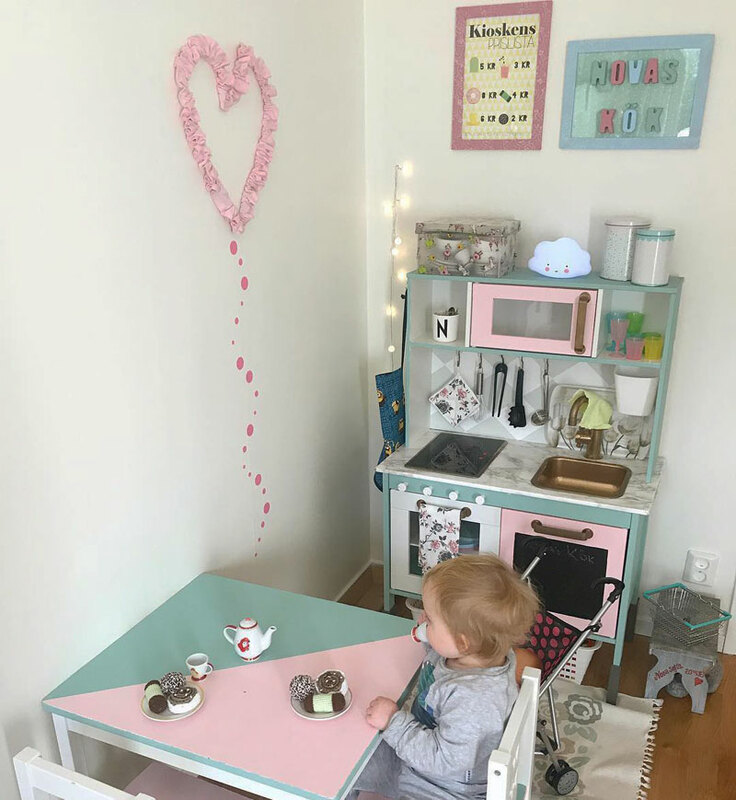 A small table with chairs could make a fantastic dining area within the kitchen where the whole family could sit down for a play pretend lunch after the little cook has prepared a meal.